Available only to our students, these materials serve as a great accompaniment to training. The Hoshin Jutatijutsu training DVDs are an excellent way to digest techniques as you follow along with the Hoshin belt manuals. These DVDs cover everything in their respective belt manuals as well as the philosophy and dynamic of that particular belt. 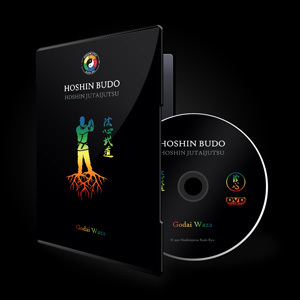 This DVD contains the Godai Waza forms of movement for each kyu grade belt. They allow for a deeper understanding of the elemental dynamics and make it easier to learn and integrate the Hoshin Jutaijutsu techniques. Use appropriate breath and intent. Presented by Sensei Rob Williams, are the Shoden (First level), Chuden (Middle level), Okuden (“Secret” level) and Kuden (Oral tradition) levels of training. Available to Hoshin instructors only.